I’ve been struggling with this for a few months, but finally found the motivation and the second wind to finish it how I’d like. 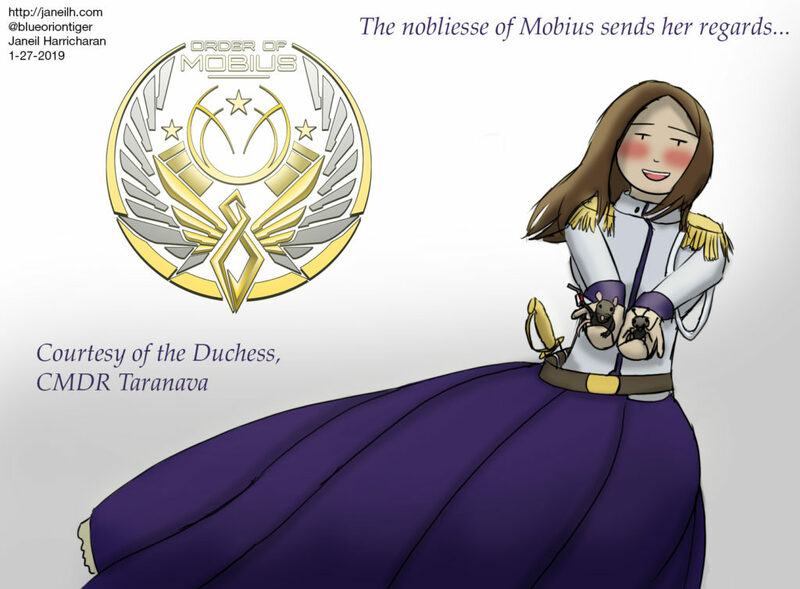 More of CMDR Taranava and her awesome goodness; here, she poses with the mascot for the Fuel Rats, and online Elite: Dangerous community figurehead ObsidianAnt. With some recent events that came up, I found it no better time than now to get this done. This was specifically done for the peeps on the Distant Worlds 2 Expedition, as most of those guys are explorers and suffer a lot when nonsense gankers wreck the party for everyone. Us Mobius peeps wish you the best on your massive journey, and always welcome you guys to play in our group as a safe haven if you need. Logo courtesy of local Mobius graphic designer Mike Northeast. EDIT: This apparently got a little bigger than I thought it would! The head admin thought it was great enough to post to their official Twitter page.